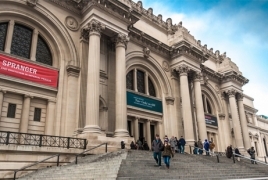 PanARMENIAN.Net - This year, New York’s Metropolitan Museum of Art is adding an extra dose of exuberance to the ritual—with the help of a little peppy punctuation. The museum has titled its upcoming exhibition “Armenia!”, art market website Artnet says in a fresh article, specifically focusing on the exclamation point in the title. The show, which opens in September, will explore Armenian arts and culture during the Medieval period, from its fourth-century conversion to Christianity to its lead role in forging international trade routes in the 17th century. "But why the exclamation point? And how is the title’s tonality to be understood? Is it a guttural battle cry? A shriek of surprise? A call across a crowded subway platform to an old friend glimpsed boarding a train? A eureka-like shout of stunned recognition that Armenia is the country whose art you long to appreciate the most of all? "Or, alternatively, is it a ploy to infuse a show about medieval art with more immediacy, perhaps making it more tempting to hard-to-reach millennials?," the article questions. "None of the above, according to the Met. A spokesperson for the museum told artnet News that the idea came directly from curator Helen Evans, who “urged the use of the exclamation point because it suggests the vibrancy of Armenian art and culture during its medieval centuries and today." "We then asked if the punctuation merits any additional emphasis or energy when pronouncing the show. “No, we say it like a regular word,” we were told. "Now that’s a show that might appeal to millennials!" “Armenia!” opens at the Metropolitan Museum of Art in New York on September 22, 2018.